Background: Osteogenesis is a common problem after surgery for femoral neck fracture in elderly patients. Internal fixation for the treatment of femoral neck fracture should be performed to optimize bone remodeling and strengthen fractured bone trabeculae, with the aim of achieving strong fixation from the perspective of biomechanics. Percutaneous internal fixation with cannulated compression screws has become a preferred treatment method of osteoporotic femoral neck fracture in elderly patients, but the insufficient holding power of the screws used in the femoral neck does not lead to strong fixation. An alternative, joint prosthesis is recommended for the repair of femoral neck fracture in elderly patients. However, its long-term therapeutic effects in the treatment of osteoporotic fracture of proximal femoral neck remain poorly understood in patients with avascular necrosis of the femoral head. Methods/Design: A single-center, prospective, randomized controlled, open-label trial will be performed in Qinghai University Affiliated Hospital, Qinghai, China. One hundred patients with avascular necrosis of the femoral head complicated by osteoporotic femoral neck fracture will be randomly assigned to two groups. Group 1 will undergo percutaneous internal fixation with cannulated compression screws (n = 50) and group 2 will be implanted with cemented femoral stem (n = 50). The primary outcome measure is hip joint function evaluated by Harris hip scores taken at baseline (prior to surgery), 1, 6 and 12 months after surgery. 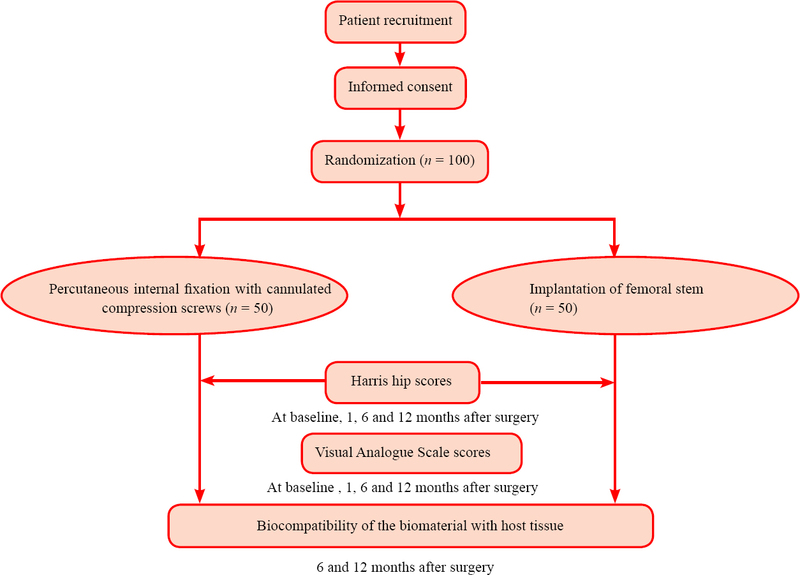 The secondary outcome measure is hip joint pain score on a Visual Analogue Scale at baseline (prior to surgery), 1, 6 and 12 months after surgery. Other outcome measures include the percentage of patients presenting with femoral head collapse, bone non-union, sterile prosthesis loosening or peri-prosthesis infection 6 and 12 months after surgery. These will be used to evaluate the histocompatibility of biomaterial with the host tissue. Discussion: Randomized controlled studies are scarce on the long-term therapeutic effects of surgery in the treatment of osteoporotic femoral neck fracture in elderly patients presenting with avascular necrosis of the femoral head. This will be the first study to investigate the feasibility of implantation of cemented femoral stem versus percutaneous internal fixation with cannulated compression screws in the treatment of osteoporotic femoral neck fracture complicated by avascular necrosis of the femoral head. It will test from the perspectives of safety and efficacy through a stringent randomized controlled trial based on a 12-month follow-up evaluation. Trial registration: ClinicalTrial.gov identifier: NCT02901938; registered on 12 September 2016. Ethics: This study protocol has been approved by the Medical Ethics Committee of Qinghai University Affiliated Hospital in China (approval number: QHY1019W) and will be performed in accordance with the guidelines of the Declaration of Helsinki, formulated by the World Medical Association. Informed consent: Signed informed consent regarding trial procedure and treatment will be obtained from each patient or their guardians. Femoral neck fracture is a common fracture that accounts for 3.58% of all fractures, occurs easily in the elderly with an age related increased incidence, predisposes to bone non-union, and greatly influences a patient's mental and physical health. Bone non-union often occurs after femoral neck fracture because of the anatomic position, biomechanical property and local blood supply. Avascular necrosis of the femoral head is a common complication of femoral neck fracture. With recent advances in treatment of avascular necrosis of the femoral head, fracture healing rate can reach over 90%, but the rate of avascular necrosis of the femoral head is still not greatly decreased (Luo et al., 2012; Li et al., 2013; Kain et al., 2014). The objective of treatment of femoral neck fracture in patients aged 65 years and above is to rapidly restore lower limb function and reduce the complications caused by long-term bed rest. Surgery for the treatment of femoral neck fracture in the elderly is a satisfactory option because it not only contributes to the recovery of joint function, but also decreases the incidence of complications (Bhandari et al., 2005). Several concerns are addressed during the process from the design of the internal fixation equipment to the selection of clinical treatment protocol, including minimizing surgical trauma, shortening length of surgery and promoting functional recovery of hip joint. Osteoporosis is generally considered the most difficult problem to be solved after surgery for femoral neck fracture in the elderly patients (Inngul et al., 2013). The key points for the internal fixation for femoral neck fracture are to optimize bone remodeling and strengthen fractured bone trabeculae, yielding a biomechanically strong fixation (Squires and Bannister, 1999). Percutaneous internal fixation with cannulated compression screws has become the preferred treatment method of osteoporotic femoral neck fracture in elderly patients because of its short length of surgery and lower blood loss. However, the insufficient holding power of the screws used in the femoral neck does not lead to strong fixation. Therefore, joint prosthesis is recommended for the repair of femoral neck fracture in elderly patients (Blomfeldt et al., 2007). Clinical efficacy has been confirmed for the implantation of a femoral stem for the treatment of early proximal femoral neck fracture (Yi and Wang, 2012). The long-term therapeutic effects in the treatment of osteoporotic fracture of proximal femoral neck remain poorly understood in patients with avascular necrosis of the femoral head. This study will investigate the effects of implantation of cemented femoral stem versus percutaneous internal fixation with cannulated compression screws on hip joint function recovery. The subjects are elderly patients with osteoporotic fracture of proximal femoral neck complicated by avascular necrosis of the femoral head. Assessment will be made of pain, femoral head collapse and sterile prosthesis loosening, peri-prosthesis infection and the histocompatibility of the prosthesis material with the host tissue. These will provide scientific evidence for selecting surgical methods and internal fixation/artificial prosthesis material for osteoporotic fracture of proximal femoral neck in elderly patients. We performed a search of PubMed, Web of Science and Wanfang Database up to August 2016 for articles regarding artificial prosthesis treatment of osteoporotic femoral neck fracture and found that the majority of previous reports focused on early femoral neck fracture (Li, 2011) and patients were generally followed up for no more than 6 months (Wang et al., 2014). We will cover a 12-month follow up observation of various functions to compare outcomes of operations by the implantation of cemented femoral stem versus percutaneous internal fixation with cannulated compression screws. A prospective, single-center, randomized controlled, open-label trial. Qinghai University Affiliated Hospital, Qinghai, China. A total of 100 eligible patients with osteoporotic femoral neck fracture complicated by avascular necrosis of the femoral head hospitalized in Qinghai University Affiliated Hospital, China and scheduled to receive treatment will be randomly assigned to undergo either percutaneous internal fixation with cannulated compression screws (n = 50) or implantation of cemented femoral stem (n = 50). The primary outcome measure is hip joint function evaluated by Harris hip scores at baseline (prior to surgery), 1, 6 and 12 months after surgery. The secondary outcome measure is hip joint pain score on a Visual Analogue Scale (VAS) at baseline (prior to surgery), 1, 6 and 12 months after surgery. Other outcome measures include the percentage of patients presenting with femoral head collapse, bone non-union, sterile prosthesis loosening or peri-prosthesis infection 6 and 12 months after surgery, which will be used to evaluate the histocompatibility of biomaterial with host tissue. Flow chart of the study protocol is shown in [Figure 1]. A total of 100 patients with femoral neck fracture from Qinghai University Affiliated Hospital, China will be included in this trial. In accordance with a previous report (Li, 2011), we hypothesized that the percentage of patients with excellent hip joint function as per Harris hip scores after percutaneous internal fixation with cannulated compression screws and implantation of femoral stem will be 47% and 80%, respectively. The final effective sample size was n = 42 for each treatment method with a significance level of α = 0.05 (two-sided), β ≤ 0.1, power = 90%. Taking a 20% rate of lost patients into consideration, we would require 50 patients for each treatment method. Sample size calculation will follow the intention-to-treat principle. After providing signed informed consent, patients' baseline data will be evaluated prior to surgery, including gender, age, body height, body mass, American Society of Anesthesiologists (ASA) classification, history of diseases (diabetes mellitus, cardiovascular disease, lung disease, peripheral vascular disease, dementia, hypertension), history of smoking, history of alcohol use, laboratory examination, X-ray examination, Harris hip score, and VAS score [Table 1]. Patients with femoral neck fracture in the wards and clinics of Qinghai University Affiliated Hospital, China will be informed about the trial by their attending physician. Patients/relatives who are interested in participation in the trial can contact the project manager via telephone, e-mail or WeChat. Prior to surgery, we will use a random number table generated by SPSS 19.0 software (IBM Corp., Armonk, NY, USA) to number the 100 patients in successive order. The patients assigned even numbers will undergo percutaneous internal fixation with cannulated compression screws and those assigned odd numbers will undergo implantation of femoral stem. Outcome assessors will be blinded to the assigned numbers which will not be revealed until the eligible patients agree to participate in the trial and then corresponding interventions will be performed. Grouping and interventions will be blinded to outcome assessors but they will be not blinded to patients and physicians. The patients will be asked to lie in the lateral position and anesthetized using a combined spinal epidural technique. After routine sterilization, a 15 cm long arc-shaped incision will be made in a greater trochanter-centered area posterior to the hip joint. Along the incision, the skin, subcutaneous tissue, and fascia lata will be incised in the direction of their fibers. Full-thickness gluteus maximus muscle will be bluntly split up to the posterior part of the iliotibial tract. The gluteus maximus muscle at the attachments of the fascia lata was detached and the hip joint will be inwardly rotated, with the short muscle responsible for outward rotation in the tension state. At the same time, the sciatic nerve will be dissociated, piriformis muscle and obturator internus dissected at the site of greater trochanter, and the quadratus femoris dissected to fully expose the posterior hip articular capsule. A T-shaped incision will be made along the edge of the acetabular rim. The hip joint will be positioned flexed and inwardly rotated to facilitate the prolapse of the fractured femoral neck stump and thus the femoral head will be taken out. The stumps of the femoral neck will be trimmed as follows: The medial cortical bone of the femoral neck will be left up to 1.5 cm above the superior border of the lesser trochanter. The lateral cortical bone of the femoral neck will be trimmed to the base of the greater trochanter, and the anterior and posterior cortical bone of the femoral neck will be trimmed equally. The medullary cavity will be enlarged and washed. An umbrella-shaped cemented restrictor will be positioned, and the medullary cavity will be filled with bone cement using a grouting apparatus. Femoral head prosthesis with hydroxyapatite-coated BG-IV-TD titanium alloy femoral stem (Beijing AKEC Medical Co., Ltd., Beijing, China; diameter 4ͱΜ) and metal ball head (Beijing AKEC Medical Co., Ltd.) will be implanted. The neck support handle will be positioned in the center of the medullary cavity and surrounded by uniform bone cement and kept in the leaning angle until the bone cement solidifies. Then the bone cement residue will be cleared and rinsed. The lower limb will be tractioned and the artificial femoral head will be compressed toward the acetabulum. At the same time, femoral head prosthesis will be reduced to make the motion of the femoral head unlimited. After repeated washes for hemostasis, the equipment and gauze will be checked and a negative pressure drainage tube will be positioned in the articular cavity. The joint capsule, piriformis muscle, obturator internus and quadratus femoris will be sutured. The patients will be asked to lie in the lateral position and anesthetized using a combined spinal epidural technique. Inward rotation and traction of the lower limb for reduction will be performed under the C-arm fluoroscopy. After sterilization, three guide pins will be inserted below the trochanters, through the femoral neck and toward femoral head. The three guide pins inserted will be positioned in a triangular shape and kept at a 15° anteversion angle with a depth of 0.5 cm below the articular surface of the femoral head. Under the C-arm fluoroscopy, a 1.5 cm long longitudinal incision will be made on the skin from the end of the guide pins. A sleeve will be positioned on the surface of cortical bone. A pore will be drilled along the guide pin using a core drill. Three cannulated compression screws (Beijing AKEC Medical Co., Ltd.; titanium alloy, diameter #3) will be tapped. After compression, the guide pins will be withdrawn. Under the C-arm fluoroscopy, the femoral head prosthesis will be reduced and its position confirmed. After repeated washes and hemostasis, layer by layer sutures will be made as above. After surgery, all patients will undergo routine drainage, preventive anti-infection and functional rehabilitation exercise. Intravenous administration of antibiotics will be performed for no more than 24 hours and strip drains will be removed within 48 hours. According to the treatment principle recommended by Orthopedics & Traumatology in Chinese Medicine (Zou, 2004), patients will be asked to perform functional exercise of the lower limbs, such as raising their legs, kicking, and flexion and extension of ankle joint. Simultaneously, according to the theory of orthopedics and traumatology, the tendon-soothing maneuver will be used by the rehabilitation physicians to promote the qi and blood circulation in the patient's affected limb to guard against muscular atrophy. All recruited patients will have a 3-month bed rest, and perform exercises under partial load condition 6 months after surgery and under full load condition a minimum of 9 months after surgery. All patients will be followed up once every 6 months for 1 year. At the follow ups, X-ray images and CT scans of the affected limb will be performed by experienced radiologists from the same imaging department to judge the progression of the femoral head disease and follow-ups will be terminated if femoral head collapse occurs. Harris hip scores (Harris, 1969) at baseline (prior to surgery), 1, 6 and 12 months after surgery, which will be used to evaluate the recovery of hip joint function from the domains covering pain, function, absence of deformity, and range of motion, with higher scores indicating better hip joint function. Hip joint function is scored as follows: ≥ 90 is excellent, 80-89 very good, 70-79 good, and < 70 poor. Rate of excellent and good hip joint function is calculated as the number of patients with excellent and good hip joint function per group/total number of patients per group×100%. VAS scores (Elkhodair et al., 2011) at baseline (prior to surgery), 1, 6 and 12 months after surgery, which will be used to evaluate the severity of pain in a range from 0-10, with higher scores indicating more severe pain. A score of 0 represents no pain, scores > 0 and ≤ 3 mild pain, scores > 3 and ≤ 6 moderate pain, and scores > 6 and ≤ 10 severe pain. The percentage of patients presenting with femoral head collapse, bone nonunion, sterile prosthesis loosening or peri-prosthesis infection at 6 and 12 months will be used to evaluate the histocompatibility of biomaterial with the host tissue. The schedule of outcome measurement assessments is shown in [Table 2]. recorded on the electronic case report form provided by the sponsor after each patient's visits for rechecking purposes. Thus, the recorded information can reflect patient's latest outcomes. Information accuracy will be rechecked after all included patients are followed up. The electronic data capture system will be locked by the project manager and will not be altered. All information relating to this trial will be preserved by Qinghai University Affiliated Hospital. The electronic data will be fully disclosed to a professional statistician for statistical analysis. Anonymized trial data will be published at http://www.figshare.com . Normally distributed continuous variables will be expressed as the mean ± SD and non-normally distributed variables will be expressed as the median and quartiles. Categorical variables will be expressed as counts and percentages. All data will be statistically analyzed using SPSS 19.0 software (IBM Corp.). Two-sample t-test or Mann-Whitney U test will be used for comparisons of Harris hip scores and VAS scores between percutaneous internal fixation with cannulated compression screws and implantation of femoral stem surgeries. The chi-square test or Fisher's exact test will be used for comparison of histocompatibility of biomaterial with host tissue. A level of P < 0.05 will be considered statistically significant. Trial progression will be reported to the ethics committee of Qinghai University Affiliated Hospital, China every 6-12 months, and the trial's status will be updated in the registration database. Only the necessary data limited to studying the effectiveness and safety of percutaneous internal fixation with cannulated compression screws/implantation of femoral stem in the treatment of osteoporotic femoral neck fracture in the elderly patients will be collected and processed. The process of data collection is fair and legal. The objective of data collection is specialized, identified and legal. The collected data are statistically sufficient, relative but not excessive to the study objective, and the data unrelated to study objective will not be collected. The collected data are accurate and will be updated if necessary. Consent regarding data collection will be acquired before data collection. The collected data will not be disclosed to any non-authorized persons or unlawfully taken, lost or altered. During the whole study period, the sponsor persons who have the rights to read the patient's information will not disclose the information. This study protocol has been approved by the Medical Ethics Committee of Qinghai University Affiliated Hospital of China (approval number: QHY1019W) and will be performed in accordance with the guidelines of the Declaration of Helsinki, formulated by the World Medical Association. Signed informed consent regarding trial procedure and treatment will be obtained from each patient or their guardians. Patient recruitment is ongoing at the time of submission. The aim is to provide objective evidence for selecting a surgical method and biomaterials for the treatment of osteoporotic femoral neck fracture complicated by avascular necrosis of the femoral neck in the elderly patients. This study will evaluate the safety and efficacy of percutaneous internal fixation with cannulated compression screws versus cemented femoral stem in treating these patients. These evaluations will be performed by measurements of postoperative hip joint function recovery, severity of pain and histocompatibility of the biomaterial with the host tissue. Advantages: This is a prospective, randomized controlled, open-label trial, in which we will evaluate the immediate surgical and the long term safety and efficacy of these two surgical methods. Our findings will considerably increase the current scant information on the biocompatibility of implants with host tissue in such patients. Limitations: Quality of life and daily activities are also important indices used to evaluate the efficacy of surgery. Unfortunately this study will be limited by human and material sources, so evaluations on Short Form (36) Health Survey and Barthel Index of Activities of Daily Living will not be performed. These will be considered in future studies. We are the first to investigate the safety and efficacy of percutaneous internal fixation with cannulated compression screws versus implantation of cemented femoral stem in elderly patients. Our 12-month evaluations of the postoperative hip joint function recovery, severity of pains and the histocompatibility of implants with host tissue add to previous short-term assessments of efficacy and safety. The results of this study will provide scientific prospective randomized controlled evidence for the rational use of these two surgical methods in elderly patients with osteoporotic femoral neck fracture complicated by avascular necrosis of the femoral head. Bhandari M, Devereaux PJ, Tornetta P 3 rd , Swiontkowski MF, Berry DJ, Haidukewych G, Schemitsch EH, Hanson BP, Koval K, Dirschl D, Leece P, Keel M, Petrisor B, Heetveld M, Guyatt GH (2005) Operative management of displaced femoral neck fractures in elderly patients. An international survey. J Bone Joint Surg Am 87:2122-2130. Blomfeldt R, Törnkvist H, Eriksson K, Söderqvist A, Ponzer S, Tidermark J (2007) A randomised controlled trial comparing bipolar hemiarthroplasty with total hip replacement for displaced intracapsular fractures of the femoral neck in elderly patients. J Bone Joint Surg Br 89:160-165. Chen XP, Wang JP (2013) Surgery. 8 th Edition. Beijing: People's Medical Publishing House. Elkhodair S, Mortazavi J, Chester A, Pereira M (2011) Single fascia iliaca compartment block for pain relief in patients with fractured neck of femur in the emergency department: a pilot study. Eur J Emerg Med 18:340-343. Inngul C, Hedbeck CJ, Blomfeldt R, Lapidus G, Ponzer S, Enocson A (2013) Unipolar hemiarthroplasty versus bipolar hemiarthroplasty in patients with displaced femoral neck fractures: a four-year follow-up of a randomised controlled trial. Int Orthop 37:2457-2464. Kain MS, Marcantonio AJ, Iorio R (2014) Revision surgery occurs frequently after percutaneous fixation of stable femoral neck fractures in elderly patients. Clin Orthop Relat Res 472:4010-4014. Li DF (2011) The curative effect contrast between the percutaneous hollow compression screw internal fixation and the prosthetic replacement for joint in the senile osteoporosis femoral neck fracture. Dalian, China: Dalian Medical University. Li T, Zhuang Q, Weng X, Zhou L, Bian Y (2013) Cemented versus uncemented hemiarthroplasty for femoral neck fractures in elderly patients: a meta-analysis. PLoS One 8:e68903. Liu ZH (2006) Liu Zhonghou Talks about Osteoporosis. Beijing: Beijing Press. Luo X, He S, Li Z, Huang D (2012) Systematic review of cemented versus uncemented hemiarthroplasty for displaced femoral neck fractures in older patients. Arch Orthop Trauma Surg 132:455-463. Squires B, Bannister G (1999) Displaced intracapsular neck of femur fractures in mobile independent patients: total hip replacement or hemiarthroplasty? Injury 30:345-348. Wang HG, Ye J, Zou ZB, Bai B (2014) Comparison of cementless and bone-cement prostheses in total hip arthroplasty for osteoporotic femoral neck fracture in elderly patients. Zhonghua Guanjie Waike Zazhi: Dianzi Ban 8:294-296. Yi QL, Wang XQ (2012) Clinical effects of internal fixation with cannulated compression screws versus artitifical femoral head replacement in the treatment of early femoral neck fracture in the elderly patients. Anmo yu Kangfu Yixue 3:210. Zou BG (2004) Orthopedics & Traumatology in Chinese Medicine. Beijing: Science Press. Conception and design of the study protocol: RR; patient recruitment: LWL; surgery conduction: QFG; data collection and management: RR. All authors read and approved the final version of this manuscript for publication.